How best to fight for anti-cuts policies? Jeremy's election on an anti-austerity message completely changed things compared to the first five years of TUSC's existence, when Labour was essentially just a 'Tory-lite' party. Responding to the new situation our policy since then has been to not field candidates in local elections against Labour councillors who vote against cuts in the council chamber. Politicians of whatever party who support austerity, however, are another matter and TUSC has been prepared to contest local elections against right-wing Labour councillors carrying out Tory cuts. But should that now be reviewed? The conference is an opportunity for all TUSC supporters to debate this matter out. The constituent organisations and local TUSC groups can submit resolutions on this subject for the conference, which should be received by Clive Heemskerk, the TUSC national agent, at cliveheemskerk@socialistparty.org.uk by Monday 22nd January. To inform the debate the TUSC steering committee is conducting a survey on how far local Labour councillors are preparing to back Jeremy's anti-cuts position in the 2018-19 council budget-setting process and, in the councils where they are taking place, next year's local elections. The survey covers questions on Labour councillors' budget proposals for 2018-19, what manifesto pledges local Labour Parties will campaign on in next year's elections, and whether or not right-wing Blairite councillors are being replaced by Jeremy Corbyn supporters. With most councils' budget preparations still at the committee stage, and Labour's candidate selections still ongoing, only a limited number of preliminary results were available at the November meeting (these can be seen at http://www.tusc.org.uk/txt/408.pdf). So local groups were asked to send in reports for the next meeting - to be received by Clive Heemskerk at cliveheemskerk@socialistparty.org.uk by Monday 22nd January - which will be published before the conference. 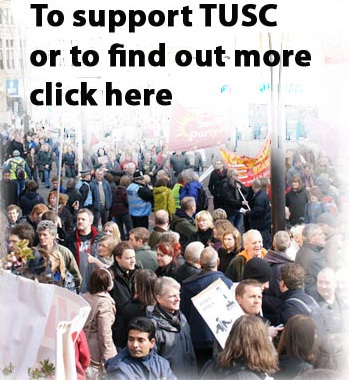 TUSC is a coalition with a national steering committee with representatives from its constituent organisations alongside leading trade unionists, sitting in a personal capacity. Other individual members of TUSC who are not members of a constituent organisation also have two places on the committee, elected by individual members at the TUSC conference. Currently the two places are filled by Pete McLaren and Roger Charles. If you want to stand as one of the Individual Members' reps on the TUSC steering committee please submit a maximum 250-word candidate statement to Clive Heemskerk at cliveheemskerk@socialistparty.org.uk - once again by Monday 22nd January. The statements will be published on the TUSC website and distributed with ballot papers to all those registering at the conference who are not otherwise members of one of the constituent organisations. There will be a lunchtime meeting of Individual Members to conduct the election. There will be a conference registration fee of £10 waged and £2 unwaged/low-waged and a capped pooled fare of £15 to not discourage attendance from outside London. This means that if your transport costs are more than £15 you can get the difference back (although please do what you can to keep costs down as any capped fare shortfall will comes from TUSC campaign funds). If your travel costs are less than £15 you will have to pay in the difference to the pooled fare. The conference will close with an open forum session on 'TUSC and the Brexit negotiations' - following the TUSC campaign in the EU referendum for a Leave vote - to see if a consensus position can be reached amongst the different components of TUSC on the various policy points that have subsequently arisen.